"How do you use oils on tape extensions?" Hair oils can be used on tape extensions, however the key to using oils is to keep it away from the adhesive (tape) part of the hair extensions; oil is used to remove adhesive residue from tape hair extensions and other bonded hair extensions. 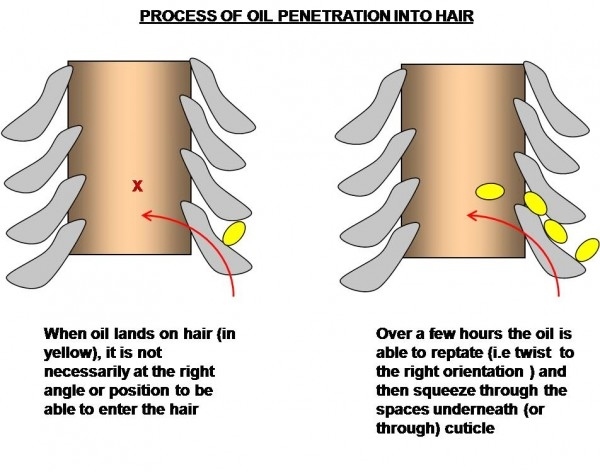 This means if oil comes into contact with the adhesive tape tabs, the adhesive will disintegrate and become sticky, which could cause matting of your growth hair. All human hair (hair extensions, wigs and growth) requires moisture (water); lubrication (oil) and protein (conditioners) in order to be healthy (supple, soft and strong). Good hair oils penetrate and lubricate hair to keep it supple and smooth. Great hair oils goes a step further and actually repairs the hair from the inside and strengthens the hair by preventing protein loss. Grand hair oils (and butters) are plant-derived and include almond, argan, coconut, jojoba and olive. Here are two easy ways to give your tape hair extensions the oils they need to remain strong, smooth and supple. Use a small amount and apply to dry hair from the mid length downwards with your fingers. Oils help seal in moisture, so after washing your hair apply a small amount of your chosen oil on the damp hair and distribute it using a wide tooth comb or your fingers. Don't rub the hair as this causes tangling and causes wavy and curly textures to fray and become frizzy once the hair is dry. "How Do You Condition Tape Extensions?" You can use whichever conditioning products you wish as long as you keep them away from the tape area of your hair extensions, whilst wearing tape in hair, you won't be able to use conditioner on your scalp or anywhere near the top part of your growth hair or tape hair extensions. There are different types of hair extension tapes and tape in hair extensions, but many adhesives are affected by the ingredients in moisturizers, shampoos, mousses, hair oils, serums and conditioners – and conditioners are frequently used to help remove adhesive residue from tape in hair extensions. What does all of this mean? It means that unless you're planning on removing your tape in hair extensions you should avoid getting any hair conditioning products on the tape part of your hair extensions. You can deep condition from the mid length to the ends of your tape-in hair extensions by applying conditioner to damp hair extensions, distributing with a shower comb (or fingers), towel wrapping and leaving for up to two hours and then rinsing. As conditioners have the ability to dry out human hair, remember to either use water based moisturizer afterwards or apply a small amount of hair oil onto the ends of the hair (not mineral oil but plant-derived oils or butters) as this will help smooth dry ends and seal moisture into the hair. That's a wrap on nourishing and conditioning tape extensions and if you’d like to know which products can be used to care for your tape hair extensions, then check out the guide, solely dedicated to styling products and tools for tape in hair extensions. There's more information in the navigation menu or you can spy on the questions asked by others in the Hair Extensions Q&A section and if that wasn't enough you can keep up to date with the next guide about tape in hair extensions, other kinds of hair extensions, wigs and hairpieces by joining our blog – no personal info required - yippee!